My kitchen sink is made of porcelain covered cast iron. I’ve named her Bertha. She eats dishes for dinner. I have always had ceramic dinner plates and because of it, Bertha has eaten very well over the years. You know the ones, the sets you can purchase from the department stores or WalMart. Inevitably one by one I would lose my plates to Bertha. See, we wash our dishes by hand here and dish washing soap can be very slippery, not to mention those ceramic plates are heavy. All it takes is one slip and crash! The plate hits the sink and either chips along the edges or breaks completely. Coffee mugs, plates, drinking glasses, none are safe from Bertha. I’ve tried buying the plastic drinking cups, bowls and plates from places like WalMart, but they’re cheap and they don’t last at all. So what I’m about to give you is an honest review of the dinner plates that have entered my life. I have a good friend named Krista who owns a company called KidSmart Living. We’ve actually known each other online for about 12 years now and I’ve tried many of the products she offers. For example, back in 2005 she sent me a set of Melamine dishes with compartments in the plates which were perfect for my RV. I still have all of those dishes and not a single was has ever broken. Amazingly durable! It’s important for you to know that I don’t post a lot of reviews on this blog, so when I do it’s truly something I believe in. 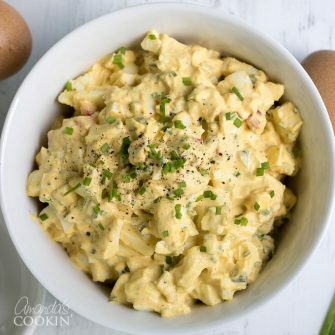 These dinner dishes I’m going to tell you about arrived around Memorial Day and we have been using them everyday since then. 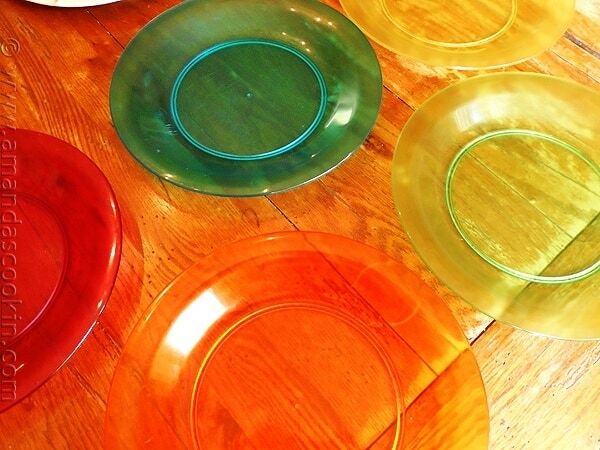 I retired my surviving ceramic plates and put these colorful, lightweight beauties in my cabinet instead. These are our regular everyday dishes that we use for every meal. I love how light they are. Look at the difference in weight between one ceramic plate (1 lb 12.6 ounces) and one of my new plates (10.5 ounces). That’s a full 1 pound and 2.1 ounce difference in weight.. for ONE plate! 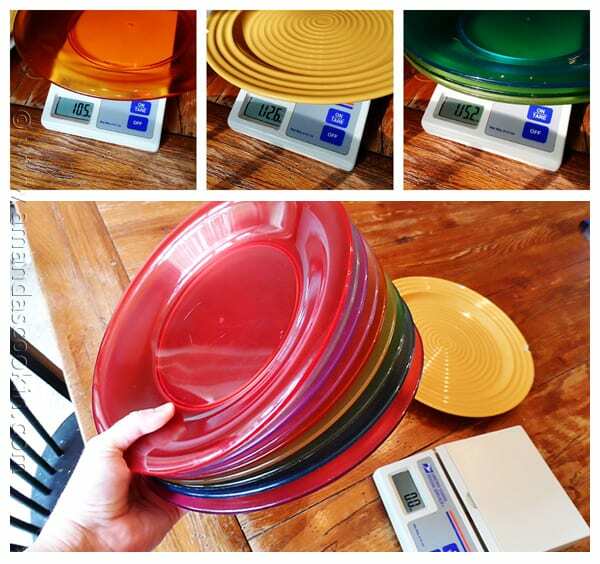 It takes almost 3 plates to match the weight of their ceramic counterpart. As you can see I can hold a stack of 9 plates in one hand without a problem. No way I could do that with the others! Since we do wash dishes by hand, the weight alone is a big deal. It also makes it a lot easier when drying those dishes, and putting them away in the cabinet. The kids noticed the difference immediately and commented how much easier they are to hold and lift. But do they hold up to everyday use? Absolutely. As you can imagine a family of six people eating dinner just about every night can really put some scratches in plastic dishes. 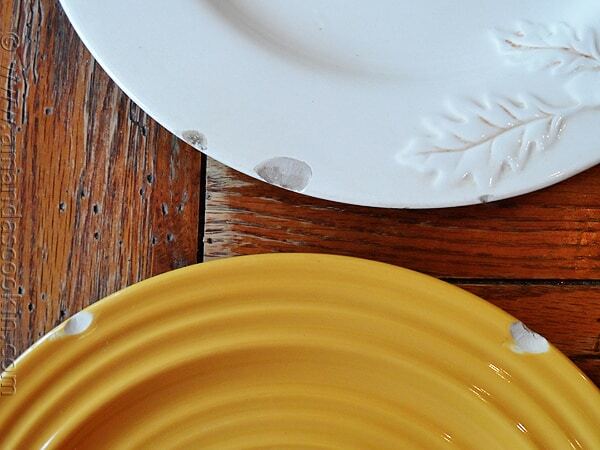 These plates are made from SAN plastic, a blend of acrylic and styrene. This plastic produces very durable break- and scratch-resistant food-safe tableware. So even with cutting from steak knives and the scratching that comes from forks, these dishes are definitely standing the test of time. Speaking of break resistant, I’ve made a short demo video for you to see exactly what Bertha is capable of. Above is a picture of pretty much what all my ceramic plates looked like. Oh and the colors! So many of them! 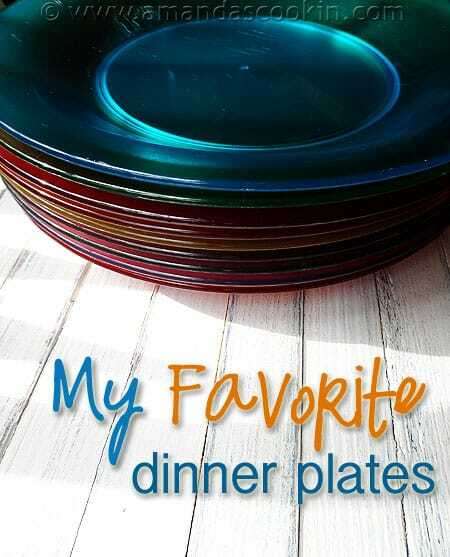 This particular line (I have the Bentley ColorWare 11″ Dinner Plates) comes in 16 different colors of which I own 10. :) I couldn’t pick just one or two! KidSmart Living also has excellent customer service. Krista and I have worked together many times in the past and she’s always held the highest integrity in her business. Customer service is very important to her. I encourage you to visit KidSmart Living and have a look around. I’ll be telling you about several other things in future posts, but be sure to check out the flour sack towels too! LOVE. Go check out her store, I’m sure you find something fun for your kitchen too! KidSmart Living provided the product for this review, however all of the opinions in this post are 100% true and totally mine. Fun! Love all of the colors! The colors are sooo appealing! As is the fact they are unbreakable. I’m heading over to check them out now. I love products I can get behind. Great review! Love the pretty colors. A rainbow with dinner, how cool is that?! I do have a set of plastic plates, but they’re used for picnics and overnight outings. If we’re to have a BBQ, it’s paper plates, but now that I see you use your plastic plates, I should think about using my plastic plates for BBQs as well. I’ve always bought institutional/restaurant supply plates (and bowls) for everyday use, as unlike dish sets found in stores, institutional plates rarely ever chip. You are of course, limited to color choice when buying institutional plates. The majority of them are plain white, but I have on occasion found white plates with a green or blue striped edge, & am quick to pick up a few of the blue striped ones! I love my Corelle dishes. I have them for years and not a chip on them, they are lightweight and very durable. I have a pattern that I love but, now I don’t care very much for the newer patterns so, I’ll keep the old ones. They still look great.